This map displays the expected flow accumulation based on the analysis of the digital elevation model. White areas are the locations where flow would accumulate, and should mirror the stream network within the watershed. This map shows the flow direction based on the slope provided by the input digital elevation model. This is an important step in understanding the overall stream networks and breakdown of sub-watersheds and catchments within the watershed. 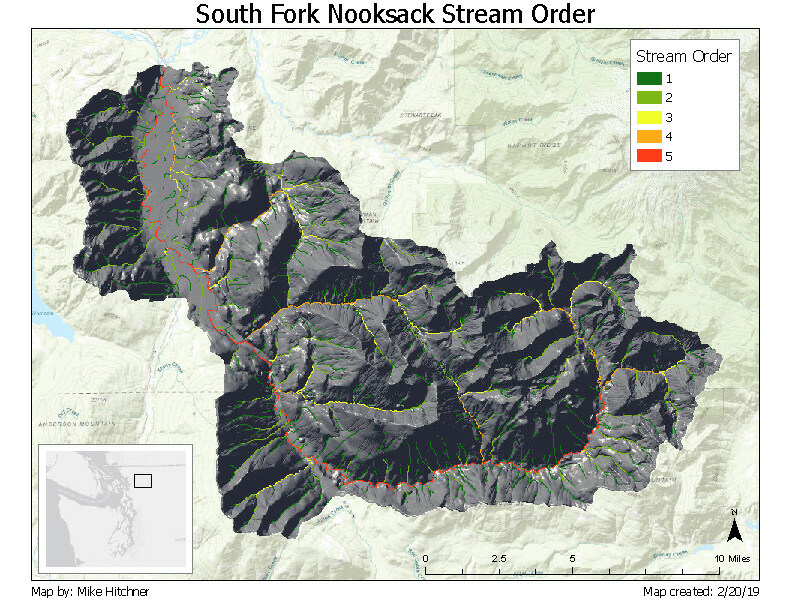 This map shows the stream order for each section within the South Fork Nooksack watershed. In order to increase one order, two of the preceding order streams must merge. So a 3 and a 4 meeting does not yield a 5, only two 4th order streams merging would form a 5th order stream. This map displays the sub-watersheds within the South Fork Nooksack watershed. Based on our analysis there are 7 sub-watersheds within the SFN watershed. Flow length helps to breakdown the watershed into subsections based on total flow distance from the headwaters of each stream to the outlet. This map shows the total number of catchments within the SFN watershed.